Emissions Analytics has extended its EQUA Index programme to test electric vehicles. 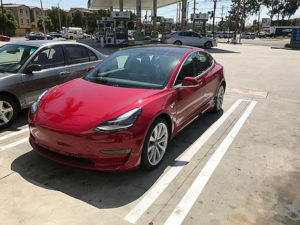 Along with partners Motor Trend, Emissions Analytics put the Tesla Model 3 through the standard EQUA Real Mpg fuel economy test, in California – the same test used for internal combustion engine vehicles and hybrids. The Tesla achieved an efficiency of 3.1 miles/kWh, which although difficult to convert into MPG equates to roughly 124.5mpg, the company said. For comparison, the 2017 Chevrolet Bolt achieved 146.8mpg and the 2017 Hyundai Ioniq EV reached 182.3mpg. Emissions Analytics say the results indicate that contrary to popular opinion, Tesla are not necessarily the market leader in terms of vehicle efficiency, which will begin to play a large role in customer decision making for electric vehicles, as battery, range and choice increase across the market. The calculation methods are now being formalised by Emissions Analytics who says it is evolving the tests to be relevant for the latest vehicles including diesels under Real Driving Emissions and EVs. After a period of open scrutiny and discussion, the testing methodology could become an official voluntary standard, for any organisation to use under CEN, or Comité Européen de Normalisation – a framework for standardisation of products or techniques across the European Union.